Product Sample: A complimentary tank top was provided to me in exchange for this styling & review. Affiliate Links: If you click on a link in this post, I may make a very small commission. I love nothing more than being introduced to local small businesses, so when Rob from Legit Tees messaged me I couldn’t wait to check out what they were making. Legit Tees is based in Seattle and have some silly, ironic, and just plain cute tank tops and t-shirts for men and women. They are unisex sizing – so be aware that if you order your normal size it may be a bit larger. I’m wearing a size small in these tanks, which is perfect for the loose/boyfriend fit that I love in a graphic tee outfit. 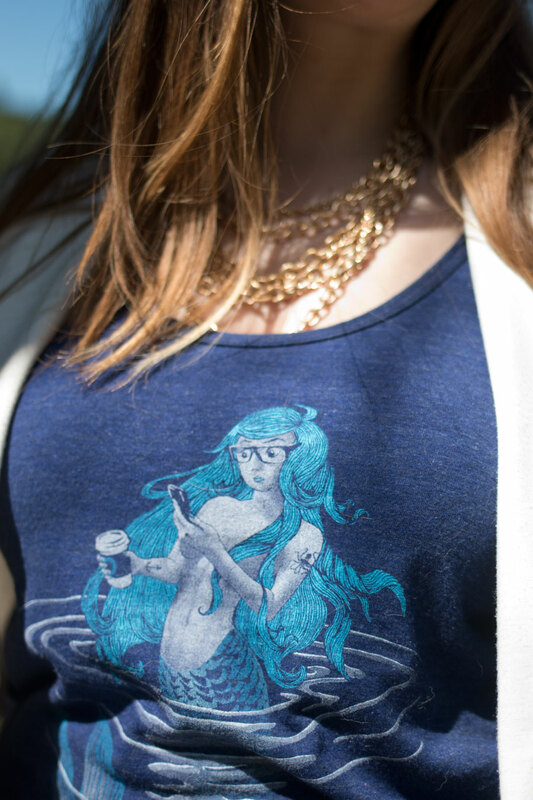 The one I’m wearing today is perfect for Seattle – it’s a hipster-looking mermaid, taking a selfie with a cup of coffee. I die. I thought it would be fun to style these graphic print tank tops in a variety of ways, so you’ll probably see another print or two in outfits throughout the summer. Hopefully, you don’t mind a little graphic print love. ;) This first styling is one I could totally get away with wearing to work. Granted, I work in a very casual environment, but I like the way this blazer and statement necklace dresses up what would have been a very simple outfit. Today my friend Hilary of Cutie Cameras is hosting a fun link up for fashion and style bloggers with a twist… we’re sharing our outfits that we wear while we’re blogging! Of course I wanted to participate, and it just so happened that one of the pieces from this outfit doubles as something I often wear around the house and while I’m blogging. Let’s be real – the minute I get home and know I’m going to be staying home for awhile, I get out of jeans and accessories and into my yoga pants! I took it a step further and went about my normal evening routine – I shower at night, and this means I’m pretty much always makeup free while blogging. I tend to be a late night blogger, but on weekends I usually can spend the early evenings writing, responding to comments, and planning posts. I’d love to see your blogging outfit too! Hilary’s link up will run for one week so be sure to share your blogging outfit. Don’t have time to post? That’s cool – you can use #BloggerOutfit on social media instead! What do you wear when you’re blogging? Or how do you like to style graphic tanks & tees? That shirt is so cute! Love how you paired it with that white blazer. 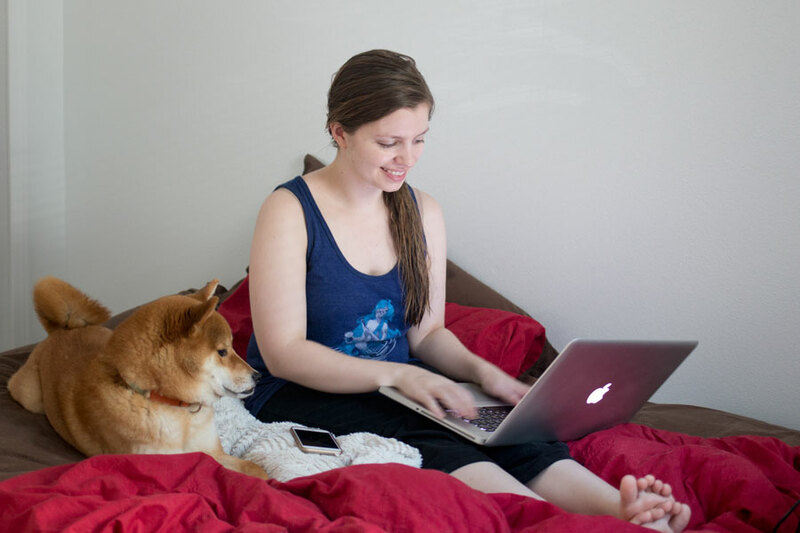 :) Totally love how in your blogger outfit photo Rigby looks like he’s interested in what you’re writing. Super cute. Love that tank! I’m a sucker for a graphic tee, and like to pair it with a pair of boyfriend cropped jeans or shorts. I live in the Caribbean, so my blogging uniform is usually just shorts and a t-shirt. Not stylish, but super comfortable and cool, lol! Thanks Kay, I thought so too! Hopefully they have a size that will work for you! Oh, I nearly (or did I?) mention that top when I saw it on the Stitch Fix post! I LOVE it. Well, I wouldn’t wear it because I’m anti-things-with-not-sleeves-that-aren’t-summer-dresses, but the print is so cute and I love the color. I might need this in my life. Really. I think you should do it. And then we could be twinz. That shirt is super cute, looks great The dog is pretty darn cute too! So cute! That is really adorable print. 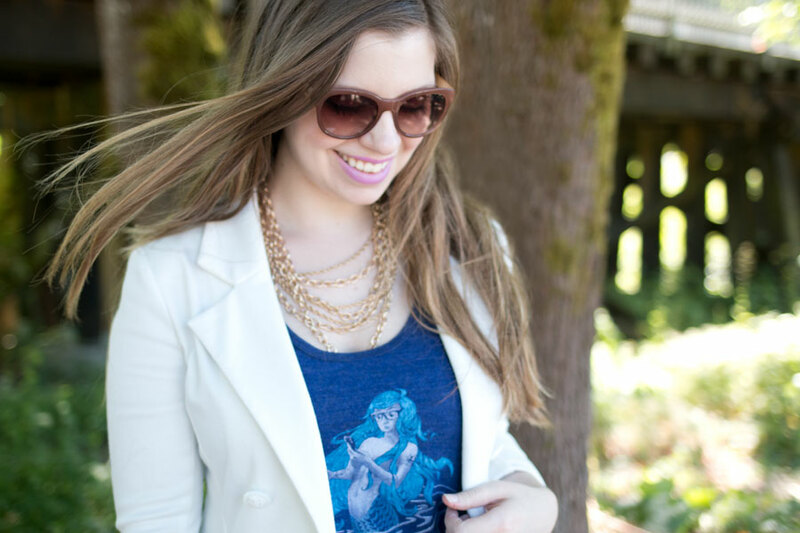 I’m not usually one for graphic tees but I do wear them at home as part of my blogger uniform. Dressing down in jeans / capris and a cute t-shirt helps me break away from my work persona since that requires that I be so technical. I know what you mean – I’m not normally one to wear them out very often, but they are fun to incorporate into my wardrobe every once and awhile! What a fun t-shirt! I think graphic tees are a really unique way to express style. I have a graphic tee from 30 Seconds to Mars that has a big picture of a wolf on it and it’s one of my favorite tees to dress up and rock. Love that! 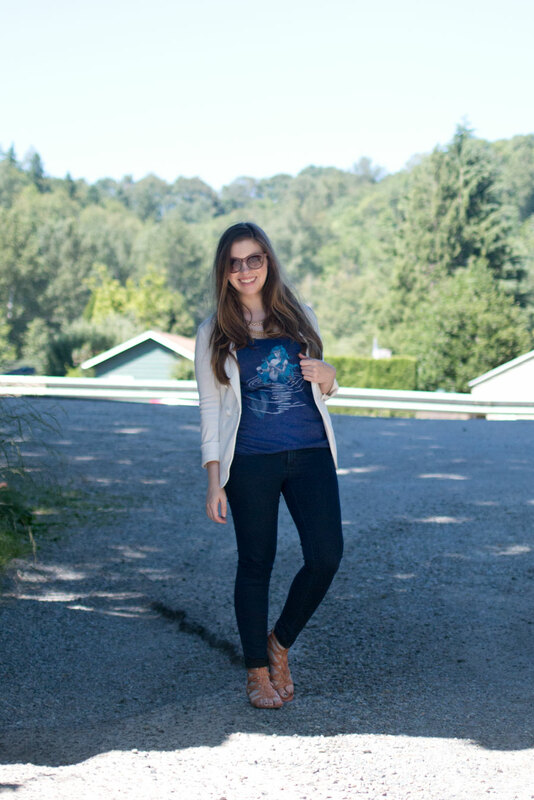 And totally agree, graphic tees are great at expressing your style! Cutest tank top EVER. I love it! This is such a fun design – totally Seattle like you said! When I’m blogging I’m usually in leggings or shorts and a t-shirt too! Usually it’s late at night or early in the am! Sounds like we have similar blogging habits – If it’s not late at night it’s early in the morning for me too! Super cute tee! You look so good wearing it. I’m going to have to get me one. It’s so awesome to see you supporting a local small business. It makes me love your blog even more. Simply put, anything comfortable but wearable out of the house! That sounds like a great outfit for blogging. A simple tee and jeans is a classic! That is totally a Seattle shirt. I’ll have to go look at the guy’s shirts, since Paul’s birthday is coming up too. Very cute! I don’t think I’ll be sharing my blogging outfit though… imagine pajamas, but during the day. Haha! I love how you were able to dress up the t-shirt into a cute outfit. It’s cute and comfortable. Thanks for sharing about Legit Tees!